The Warrior Machine! 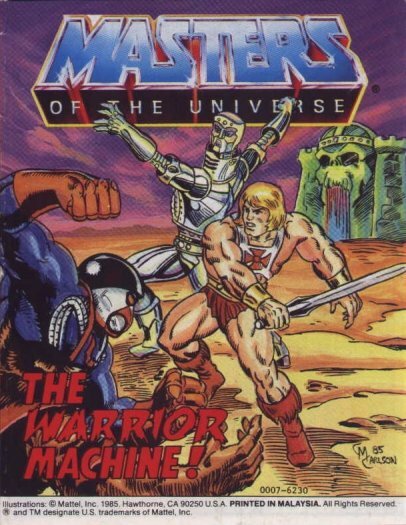 is a 1985 Masters of the Universe mini-comic. No author is credited; it’s illustrated by Chris Carlson. Here, Hordak gets up to some Frankenstein business, using his lab to create Dragstor and Extandar. For a kids’ merchandising device, the theme of power and temptation is pretty well done here (the moral on the last page jumps out to the twenty-first century reader as, perhaps, an allegory for performance enhancing drugs). There’s something of a grimmer tone at work, too: Dragstor starts out as, seemingly, an innocent peasant, and never gets turned back from being a mindless killing machine – that’s a little dark for He-Man (in fairness, there’s no reason why he couldn’t be an evil volunteer peasant, but it seems unlikely). Carlson’s art is perfectly adequate. His Fright Zone looks particularly good and the members of the Horde are nicely done, even if Hordak’s armbands appear and disappear, Prince Adam/He-Man’s face changes wildly from panel to panel, and his sword looks kind of funny. The issues with Extendar (many of which can be laid at the feet of the Mattel designers rather than the anonymous author of this comic) don’t keep this one from being a solid mini-comic.